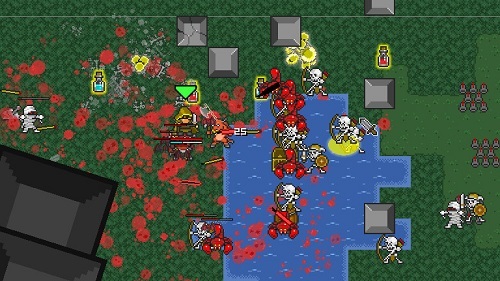 Overture is all about chaotic gameplay in a roguelike shell. It draws inspiration from a number of big franchises and combines them in such a way that you’ll have two dozen character choices for your loot and slaying based adventure. It’s all about dungeon crawling in Overture which takes place in a pixelated game world. Choice is abundant right from the get go with 24 different characters to potentially play as that each offer their own different spin on killing style. Regardless of character though you’ll find yourself controlling them with the keyboard while combining it with mouse clicks for attacks, specials and inventory management. This also goes hand in hand with a running mechanic that boosts your evasion by moving in the same direction as your mouse, making the game more strategic than comparable titles. Battles are split across multiple areas with kills rewarding experience, gold and occasionally random item drops. In addition to enemies players will stumble upon friendly NPCs which when rescued will follow you around and help you battle the wide selection of opponents which often leaves you heavily outnumbered. Despite the large number thrown at you Overture manages to maintain good variety in enemy type both visually and in terms of attack patterns. This approach to stacking the odds against the player when it comes to numbers means that death is a common occurrence of the game. Combined with the permadeath mechanic of Overture this formula is one that many players will be familiar with, it involves plenty of failure on the road to success. Accordingly the game is best enjoyed in shorter bursts to avoid frustration, all of these runs are recorded in the statistic page to help give you a sense of progression. When all is said and done Overture is an impressive game, although doesn’t quite achieve greatness in its design as each class just doesn’t feel unique enough while you’ll need a far bit of grinding to advance. Choose one of 24 unique characters. Gain levels, currency, items and NPCs in each game run. Randomised game elements ensures plenty of replay opportunities. Powerful soundtrack to keep you focused. Great array of enemies and bosses to face.